Thermoplastic hybrid composites offer a huge potential for lightweight design but due to the complex process chain for their manufacturing, the needed production plants often are quite expensive resulting in a profitability only for large lot sizes. A modular plant architecture allows a more flexible production of different parts thanks to reconfigurability. This results in cost savings which enable economical manufacturing of smaller lot sizes. 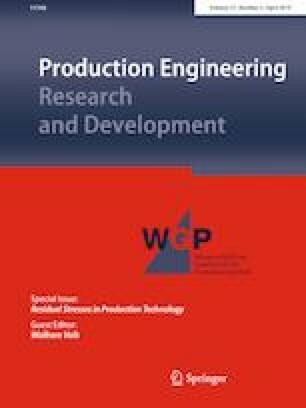 In the following paper an approach for a modular production plant for thermoplastic hybrid composites and its architecture is presented. The modules of the plant are standard machines with a uniform interface linked by OPC UA. The core is a line control module controlling the sequence of production steps, plant safety and visualization. The independent control system of the production modules is based on a service-oriented architecture and state-based control. For the engineering of the plant, an approach for fast configuration and reconfiguration is presented. Using a self-developed web application the plant can be easily configured resulting in a so called production recipe containing all the relevant information about the plant. The production recipe is imported by a code generator, which automatically converts the information in a PLC code for operation of the line control. The described approach is validated by building and commissioning two different configurations of the production plant showing the feasibility of the concept and significant gains in commissioning time. This paper is based on investigations within the research grant supported by the Federal Ministry of Education and Research (Project number 02P14A178) and supervised by the project management agency PTKA.